Balfour 'Stepping it up' on the Gold Coast ! 10 out of 10 and an A for effort ! 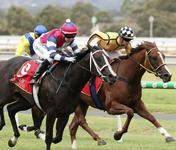 The Advertisers Lincoln Moore spoke to Ryan about 3yo filly Kenyan Wonder. A Cool 10 wins for a 10 year old ! 4yo Gods Own mare Hidatsa breaks her maiden.Ridden by Ben Paterson, Hidatsa conquered the Strathalbyn hill to fight on strongly to take out race 2 in a photo finish.Congratulations Team Hidatsa.